Posted By Carlos On February 15th 2017. Under Annotated Bibliography Tips Tags: chicago style annotated bibliography example, chicago style annotated bibliography format, example of annotated bibliography chicago style, example of chicago style annotated bibliography . 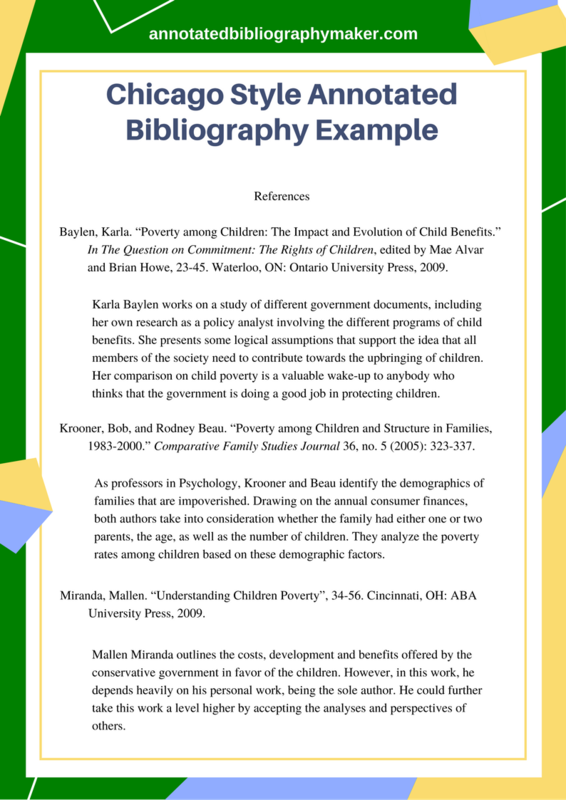 Looking at a Chicago style annotated bibliography example is often the easiest way to know how your own should look. Not following the style correctly if that is what you need to use within your paper could see your writing rejected. It is vital that you use the correct academic style in your writing exactly the way it should be used. Use our Chicago bibliography maker to make spotless Chicago citation style references. Chicago style is one of the most common formats that is used and will tell you just how your citations and references should be laid out and the information that they should contain. 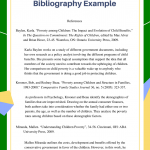 The annotated bibliography example Chicago is a list of those citations followed by the annotation. This annotation is a summary and evaluation of the sources that you have used and can be around 150 words in length or longer if a more in-depth analysis of the works is required. Getting your work formatted right is not a task that many students find easy. Ensure that you have exactly the right information and that you use it in just the right way. Each subject area and even different institutions will have different requirements as to which style you should use. You will also have to take into account what expectations they have for your annotation. If you need to find some Turabian style annotated bibliography sample, visit this page! Clarify what the style requires from you with regards to information for citations before you start your research. Collect information such as the authors’ names, the name of the publication, date of publication and the page numbers covered, etc. Finding sources that are relevant will require you to have a well developed thesis or research questions. Make sure that yours is well developed and that you understand it fully before you start looking for sources. Use scholarly search engines as well as your library to ensure that you find trustworthy and relevant sources of information. Use a wide variety of different sources such as journals, research papers and literature and not just websites that may not be the most trusted source. Maintain comprehensive notes as you do your research to be sure that you have all of the information required for your citations and annotations. Have a clear understanding of what your supervisor wants from your annotations. Are they looking for a simple 150 word summary of the sources or do they want a 2 page in-depth analysis of each? Is the author a perceived expert in this field? Have they other published works in this area? Who was the writing aimed at when it was written? Is the author biased or do they have any other agenda? Are their flaws within the research presented or other weaknesses? Once written you must carefully proofread your work. All academic writing at this level must be error free and written perfectly to get the results you are hoping for. Brown, Oscar. Sleeping after a hard night out. Colchester, England: Broadhurst, 2003. The annotation will follow the citation here. Brown, Oscar B., Emily Smith, and Emile Willis. Finding the center. Perth, WA: This University, 2001. You place your written annotation here. Brown, Oscar B. “Keeping fish waiting.” Practical fish breeding 78, no. 3 (2014): 159-162. The evaluation of the article follows the citation here. If you have reviewed our Chicago style annotated bibliography example and still want additional support with your referencing just get in contact our specialists here today for help you can trust!